Students are all smiles after they receive iPad computers for use at school and at home. Smiles were everywhere — along with some cheers — when the students of Mother of Providence Regional Catholic School in Wallingford learned they were each getting an iPad computer this year. Students were told about the program during opening week activity when Father Edward Hallinan, the pastor of St. John Chrysostom Parish, blessed the iPads in front of the students. Starting this school year, every student in grades one to eight has received a school-issued iPad. 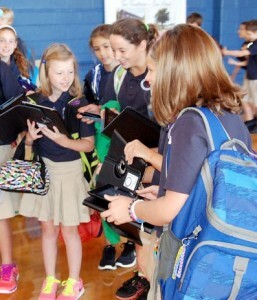 Students will take home their tablet computer each night, not leave it in the classroom. This will enable students to work on school projects at home and provide them with the technology needed for 21 century skills. Mother of Providence Regional Catholic School is one of the first elementary schools in the Archdiocese of Philadelphia to offer iPads to every student, which they can take home. “It has been a long road to get here” said Preston Tyrrell, technology teacher at Mother of Providence. “From the day we opened our doors last year we had this as our goal.” The regional school, which opened its doors in September 2012 following the closure of S.t John Chrysostom School in Wallingford and Nativity B.V.M. School in Media, spent the last year preparing the building, the teachers and the students for this program. “We are fortunate that both Nativity B.V.M. and St. John’s made the financial commitment to upgrade the infrastructure in the buildings,” Tyrrell said. Last year workers updated the wiring, ran new fiber optic cabling and installed new WiFi access points around the two-building campus. 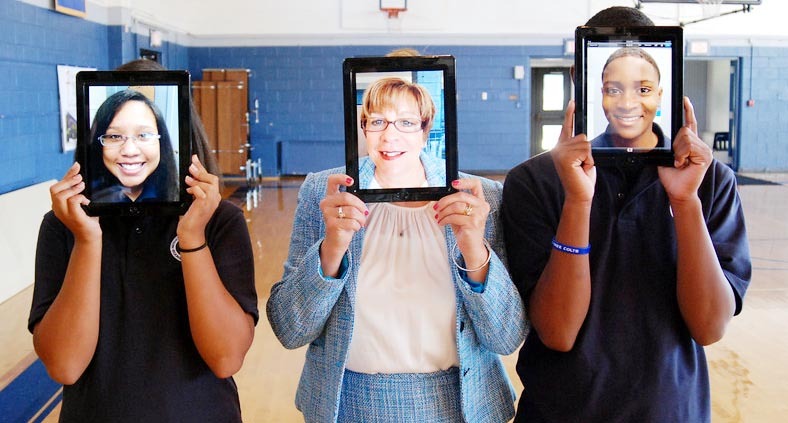 The Common Core Standards in Pennsylvania, adopted by Mother of Providence Regional and all parish and regional Catholic schools in the Philadelphia Archdiocese, include basic technology skills. But they also call for students to use technology to help them learn in all areas. Whether it is using technological tools to solve math problems, access information, promote literacy and communication or for collaborative learning, technology is part of the learning solution rather than a separate competency. 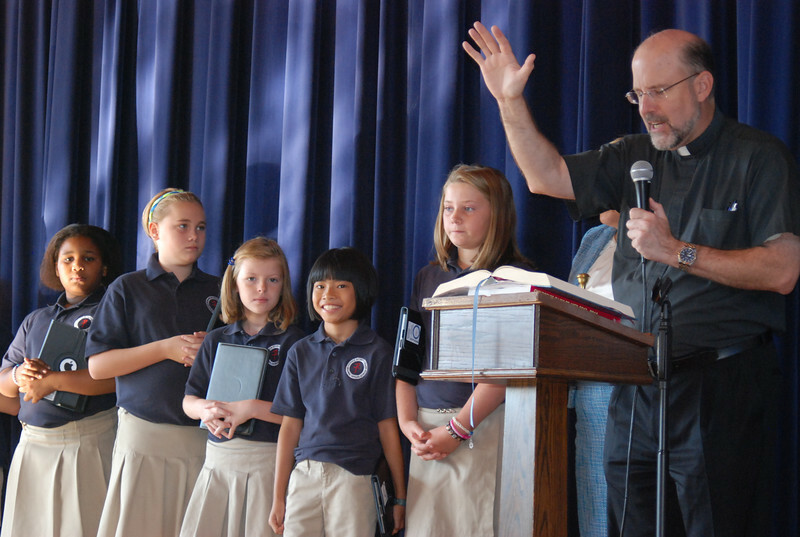 Father Edward Hallinan offers a blessing of the students who received an iPad this year at Mother of Providence School, Wallingford.